During the Jacobite invasion of England in 1745, many loyal Whigs (supporters of George II) raised regiments of troops to aid their king against his competitor, Bonnie Prince Charlie. On 24 September 1745, several Whig gentlemen of Yorkshire decided to raise a unit to aid George II. Their contribution included both a regiment of foot called the Yorkshire Blues, and a regiment of cavalry called the Yorkshire Hunters. The book Cumberland's Culloden Army 1745-46 by Stuart Reid (1) details the uniform of the Yorkshire Blues: a blue coat with red cuffs and no lapels. This is important information; however, the Yorkshire Blues also carried flags, or, in the terminology of that era, colours. 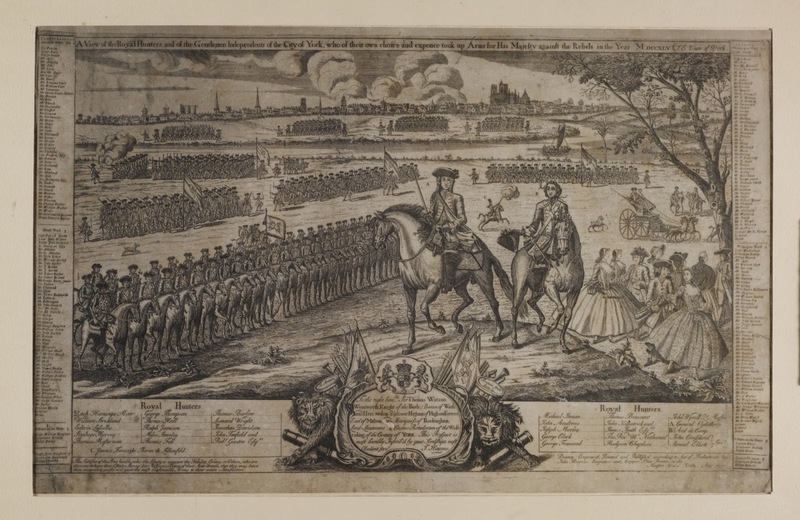 A unique eyewitness engraving shows the Yorkshire Blues and Hunters in parade, with glorious detail of their colours. I am focusing here on the Blues' colours. In the engraving, they are carried by each company (see the detail picture at right). The numbers merely serve as a legend and are not part of the original flag. It can be seen that each flag carries a shield. Thankfully, the artist included a "close-up" of the flag's details in a cartouche near the bottom of the picture. It can now be seen that the shield has a cross running through the center with five animals on it. These animals reminded me of heraldic lions and further research revealed that this unique distribution of lions on a cross is the coat-of-arms for the city of York. What would be more appropriate than to put the city's coat of arms on its regiment's flags? 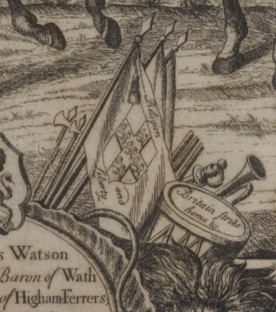 But there is another detail visible in the print under consideration: script both above and below the York coat-of-arms. 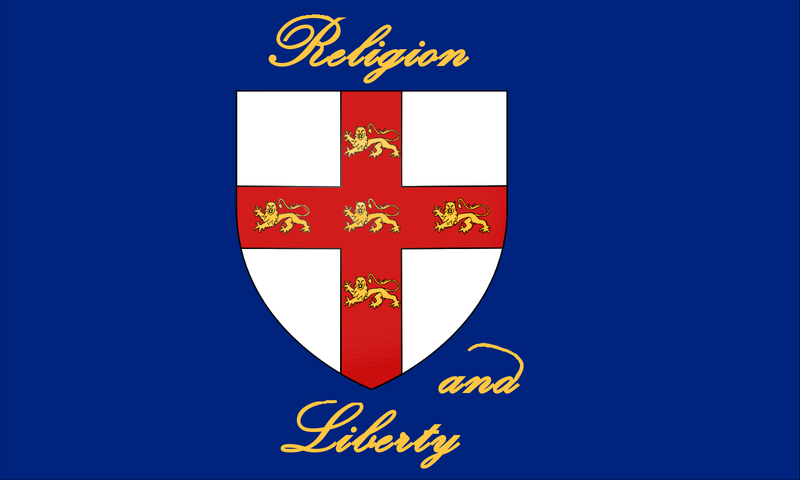 Above it reads "Religion", while below the shield, "and Liberty." Below is my reconstruction of the Yorkshire "Blues" regimental flag. The city of York's coat of arms is a white shield with a red cross of Saint George and five golden lions. This is fact, but the colors of rest of the flag is an educated guess. The ground of the flag I have colored blue, with golden script. Why blue? While regimental flags were typically in a regiment's facing (cuffs and lapels) colors (2), red flags were reserved for the three elite Regiments of Foot Guards. Not even regiments with red facings (e.g. the 33rd Regiment) were allowed red flags; instead, they carried white flags with a Cross of Saint George (3). To have a provincial regiment carry flags with a red ground would be highly unusual. I have therefore chosen to color the flag's ground blue, based on the unit's nickname. While nicknames generally attached to the unit's facing colors, such as the 3rd "Buffs" or 71st "Scottish Whites", there are instances where a nickname referred to the unit's coat. The King's Royal Regiment of New York was known as "Johnson's Greens", not because of its facing color, but instead because of its coat color. In the same way, the Yorkshire "Blues" were nicknamed because of their coat color. Since this is the case, I believe that blue is the most reasonable choice for their flag. The motto "Religion and Liberty" appears in gold, in much the same way as the flag of the 60th Royal Americans. (4) While I freely admit that my recreation is tentative, I believe that every artistic choice can be defended historically. But another flag also appears in the original: a standard carried by the Blues' sister regiment, the mounted Yorkshire Hunters. Stay tuned for an analysis and reconstruction of their flag! (1) Reid, Stuart, Cumberland's Culloden Army 1745-46. Oxford: Osprey, 2012. pg. 45. For more about the Yorkshire Blues, see also Duffy, Christopher, Fight for a Throne: the Jacobite '45 Reconsidered. West Midlands: Helion and Co, 2015. pgs. 184-185, also pgs. 345-346. (2) http://www.fifedrum.org/crfd/BD_1.htm. This link reproduces the Royal Clothing Warrant of 1751, which regulated the uniforms, flags, and drums of King George II's British army. Regimental flags in the facing color was a tradition which existed before the Clothing Warrant of 1751. (3) http://kronoskaf.com/syw/index.php?title=33rd_Foot. 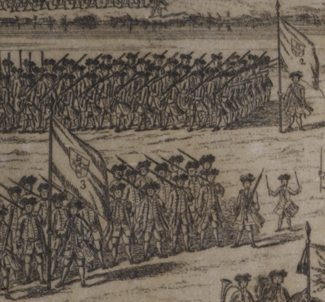 A depiction of the 33rd Regiment's flags during the Seven Years War appears on this page. Since the Foot Guards carried red regimental flags since the 1600s, this prohibition against red flags for anyone else had existed long before the Clothing Warrant of 1751. (4) http://kronoskaf.com/syw/index.php?title=60th_Foot. In addition to the 60th Royal Americans, most of the regiments of foot without a distinctive badge embroidered their regimental numbers on their flags in gold. If you are a wargamer and would like to deploy this flag in your own unit of Yorkshire Blues, feel free; however, I would appreciate a credit as the artist of this flag's reconstruction :). Thank you! I'm so glad that the artist took the pains to record the flag as accurately as he did. Thanks! My Jacobite Rebellion armies are better for this information! Thank you! I've benefitted so much from others' research and am glad that now I can contribute as well. An interesting idea for the flag. Nice one!